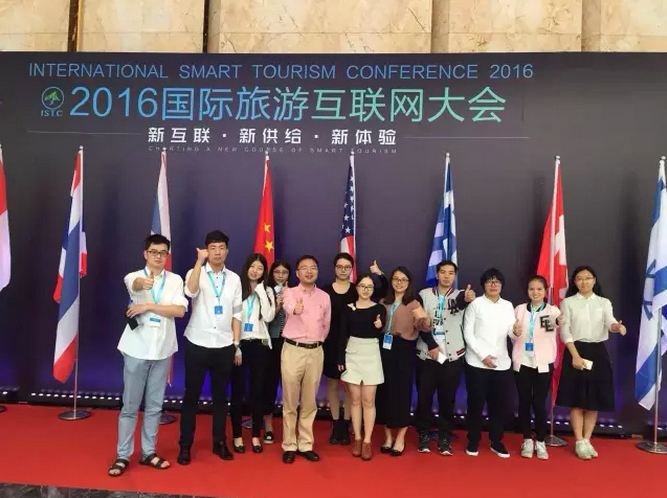 New Internet, New Supply, New Experience ---International Smart Tourism Conference: Charting A New Course of Smart Tourism. 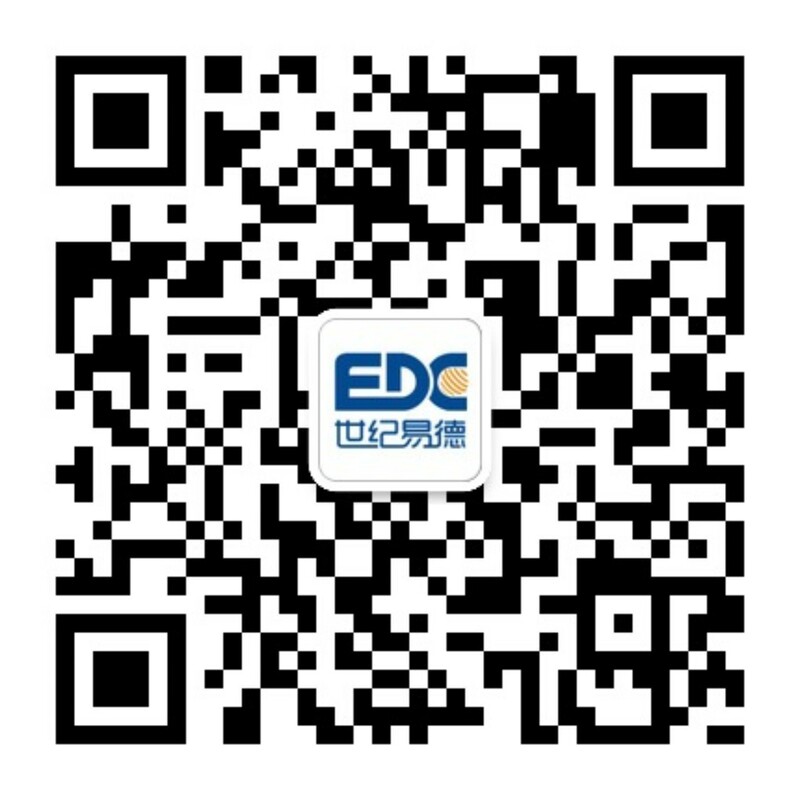 EDC serves as the exclusive partner for international smart tourism solution for this Conference. Hangzhou of 2016 is destined to be outstanding. 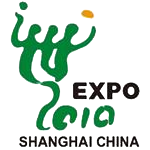 Following on the completion of G20 Summit, another grand international conference comes round. 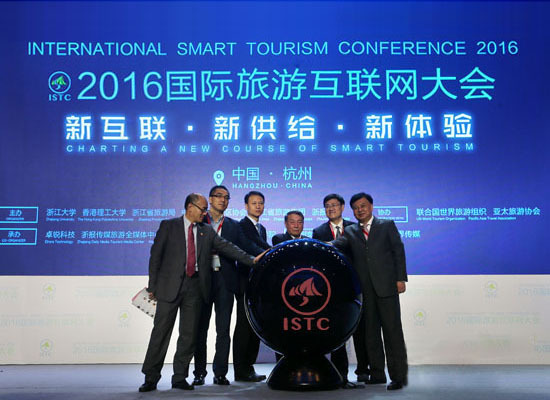 2016 International Smart Tourism Conference (ISTC) was held in InterContinental Hotel Hangzhou with a splendid gathering of over one thousand guests including leaders of domestic and overseas tourism industry, governmental authoritative leaders, top professors from scientific research institutions and experts from investment and financing organizations to focus on the hot topics of the tourism industry under the time of “New Internet, New Supply, New Experience” to develop the new era of industry development. 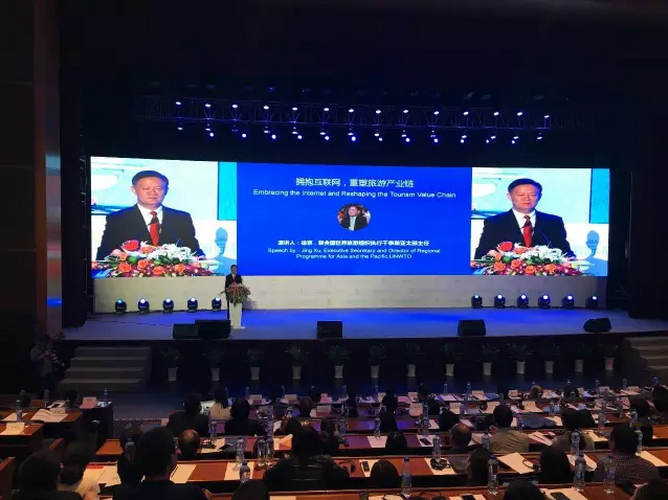 Hot words such as region-based tourism, reform of supply, virtual reality and experience economy were constantly put forward and discussed on the Conference site, where the new thought, new practice and new trend of the world tourism aggregated. 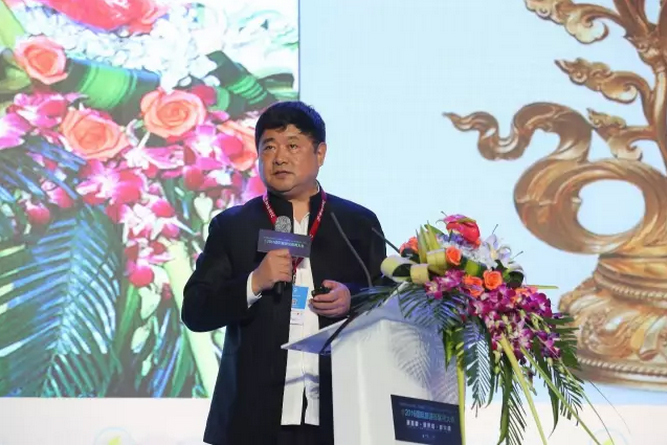 Xin Hongye, Deputy Director of Information Division of China National Tourism Administration, stated briefly that, one common point between tourism and Internet is socialization + innovation. Tourism + Internet is a strong cooperation with mutual support. For Internet, there is a foothold for socialization business and for tourism, there is a foothold for innovation ability strengthening. As a result, the key of tourism + Internet is innovation. Pang Xuequan, Director of Asia Pacific leisure and Education Research Center, Zhejiang University interpreted the relation between Internet and leisure from two perspectives, the change from Internet upon the concept of leisure and the shaping of new features of leisure and also proposed the thesis of “Develop the leisure industry in the connection of new change”. 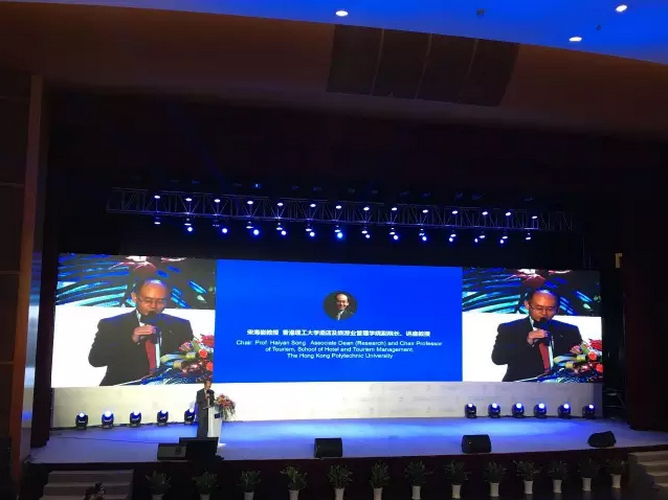 He said, during the incorporation of Internet for leisure and tourism industries, the concept of trans boundary, integration and complementation, the idea of change, innovation and share, as well as the sense of individuality, customization and diversity would be the key for industrial development. The information construction of tourism has gradually started since the first year of smart tourism. 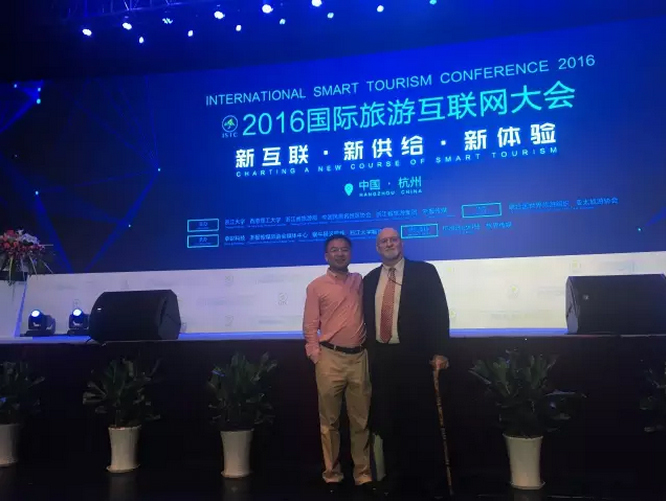 The experience and intelligence under the precipitation of exploring and practicing of smart tourism achieved collision, deepening and spread on the Conference. 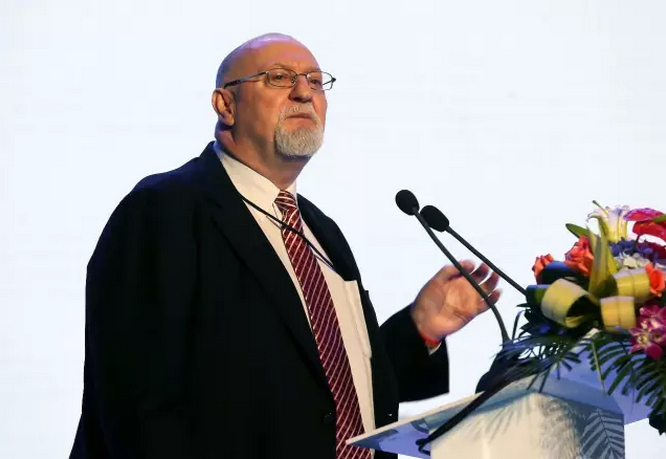 John Koldowski, Former Vice-chairman and Current Special Advisor to the CEO, PATA put forward the followed idea upon the analysis of smart standard of smart tourism management, that, so far the tourist industry has been in the commodity-based logic, which should be the service-based one in this information and interconnected ear. Three global top experts in smart tourism industry, Dimitrios Buhalis, Professor of School of Tourism, Bournemouth University and Director of E tourism laboratory, Daniel R.Fesenmaier, Professor and Director of Tourism Research Institute, University of Florida and Rob Law, Professor of SHTM, The Hong Kong Polytechnic university, brought frontier perspectives of smart tourism in North America, Europe and the Asian-Pacific region respectively from the views of “Smart tourism facing to value ecosystem”, “Tourism design based on smart tourism and big data” as well as “Application of Internet in tourism and hotel industry”. Santi Chudintra, Deputy Governor of Tourism Authority of Thailand, expressed his view upon the experience summary of tourism development in Thailand, that smart tourism was such a intelligent way of promotion in Thailand to connect people. Thailand receives large number of overseas tourists, who come to Thailand by tracing the digital promotion. We need to apply this information technology to know who are those tourists, where are they and what they want, thus to delivery our unique local customs and practices to them. On the level of industrial practice, with regard to the market aporia with large construction cost, long construction cycle and high maintenance cost that commonly existed during the process of smart tourism construction, Wu Xiwei, Co-founder of Drore Technology Co., Ltd., innovatively proposed the solution of Smart Tourism Cloud Service SaaS platform, which would facilitate the smart scenic spots been flexibly travelled in the cloud lease way of on-demand charge and personal customization. As the key body in tourism industrial chain, excellent tourist destinations from home and abroad transferred their new thoughts and new practice in deepening management, improving service and innovating marketing on the Conference. 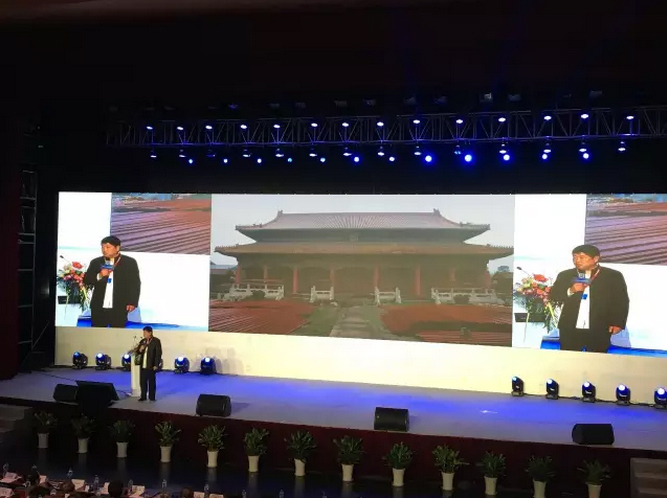 Shan Qixiang, Director of the Palace Museum, shared the “Experience of Palace Museum” derived from the upgrading of tourism experience degree and the culture of tourism commodities based on the innovation and practice in the delicacy management of cultural tourism resources of the Palace Museum. He mentioned that, the promotion of historic culture in the Internet era should be completely follow the traditional mode. Currently, the National Palace Museum has initially set up the online-offline interconnected composition platform composing of various information of site groups, APPs, multimedia data resources with the official website of the Palace Museum as the core and main portal. Anthony Lau, Secretary-general of Hong Kong Tourism Board, also attached great importance to the function of digital media in the marketing of tourist destination. He believed that, science and technology have a significant impact on the behavior of today’s travelers and lead to chain reaction in each step of the tourism. The information and comments relating to the tourist destination on the Internet may get the consumers to decide where to go and their comments during the tour will influence the decisions of the next group of travelers. As the world-famous tourism destination, Los Angeles has been well-known for its entertainment , awards ceremony and fashion. In addition to the excellent resources of the city, the integrated marketing of tourism destination under the support of the new technique and new media in Los Angeles also make a crucial contribution to the success. Kate Chang, Regional Director-China, LA Tourism & Convention Board introduced the advanced measures of Los Angeles in the tourism destination marketing in China through the methods of market survey, official website upgrading, WeChat operation, slogan creation, personnel marketing and video marketing and believed that the number-oriented and personal refined operation was an important factor to the success of tourism of Los Angeles. 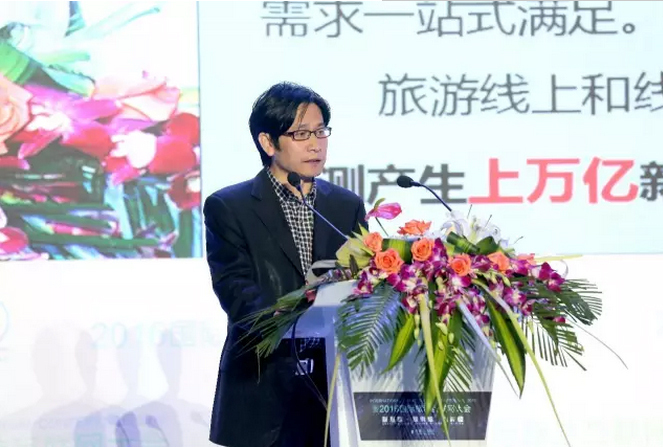 As a keyword of 2016 China tourism, region-based tourism also became the hot topic on the Conference. The proposing of strategic thinking for region-based tourism provides huge stage for development of internet industry. There is a huge blue ocean of the market upon the combination of region-based tourism and Internet.Shi Peihua, General Secretary of China Tourism Brainpower and Director of Tourism Planning Research Center of SIC took the view that, region-based tourism would bring full range of opportunities to the development of tourism internet and the integration of public information for region-based tourism would be realized via the Internet. While in the system and mechanism integration, the information integration was essential for the achievement of overall-process, all-around and tull-space aggregation and optimization of resources and service. Moreover, region-based tourism also provided the perfect platform for the industrial integration of tourism service resource and brand name products. Since the successful upgrading to 5A Scenic Spot in the last year, Tiantai Mountain has exerted itself based on the countywide resource of Tiantai into a benchmark of region-based tourism in China. 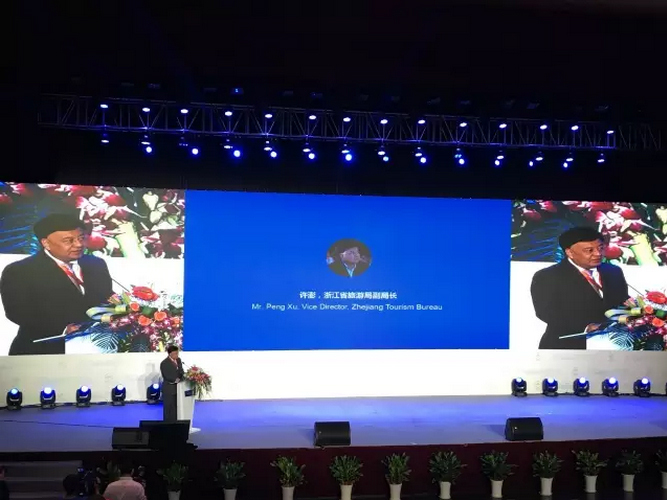 Yang Shengjie, County Mayor of Tiantai County Government, mentioned during the introduction of achievements of region-based tourism construction in Tiantai County, that countryside, agriculture, culture and industrial tourism creativity is the key and core of the development of region-based tourism resource. Offer wings of creativity and smart to region-based tourism, thus to achieve the harmonious picture of tourism in everywhere, anytime and any trade. Xiao Jie, Director of Slender West Lake Attraction Administration, gave his opinion upon the resources integration of Slender West Lake that scenic regions were still the core attraction in the era of region-based tourism and would not wither away. 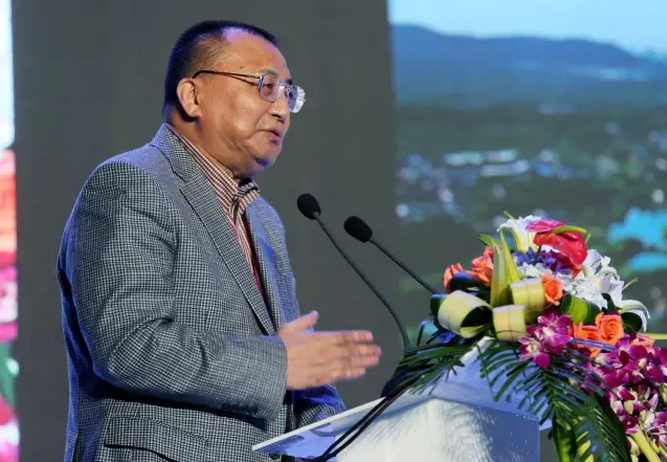 While the product variety generated by the era of region-based tourism may on the upgrade everywhere, and therefore he emphasized that the satisfying of tourists’ need of food, housing, reception, travelling, shopping and entertaining in the region-based tourism should not only rely on one scenic region. In the Internet 1.0 era, the internet format represented by search engine, e-commerce, instant messaging and online game was once the accelerator for the development of tourist industry, while science and technology has always been the source power for tourism development. In the Internet 2.0 era, the emerging technology represented by Internet of Things, artificial intelligence and virtual reality once again fills the future of tourist industry with challenges and opportunities. 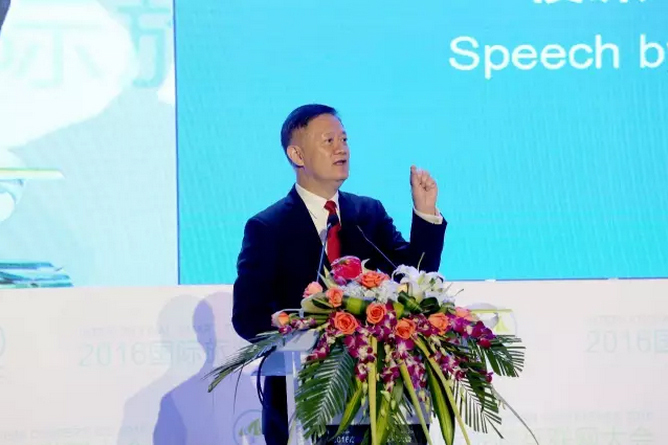 Wang Guoping, Former Secretary of Hangzhou Municipal Party Committee, presented his view as industry-wide integrated internet had become the trend, and how did the internet-connected industries realize the industrial re-upgrading via the application of new internet technology has turned into the focus of attention to all industries. As one of the earliest industries in internet-connected integrated innovation, tourist industry is also faced with the brand new node. 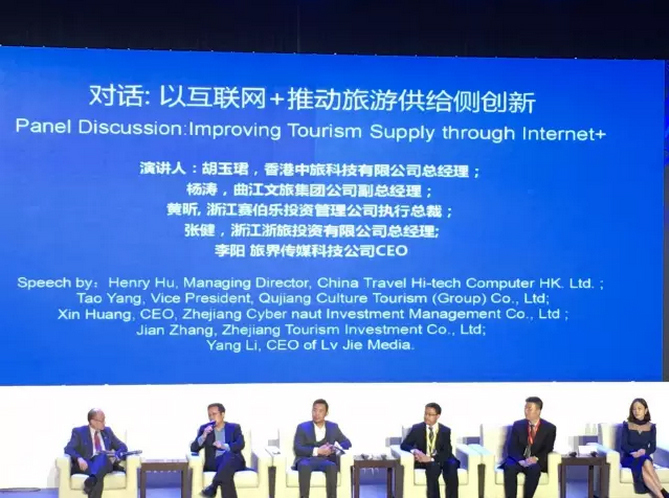 When the new wave of new internet technology comes, how to achieve the new transformation and new development through new technology would be an inevitable question for the tourist industry in the future. Fotis Provatas, Chairman of Greek-Chinese Economic Council, Former chairman of Athens City Council and Mayor of Athens shared the exploring and practicing of the Greece FORTHCRS Company and Opnewsnas website in the filed of tourism ferry service and travel information and exhibited how did the internet technology and information technology remodel the tourism behavior and change the cooperation modes of travel. In his opinion, a rigorous and complex information management system is of importance and could bring positive impact on the tourism through making future prediction based on calculation and analysis upon the historical data. What is the prospect of future tourism going to be? In the year of 2016, the explosive growth of AR (augmented reality) technology and industry seems to make the answer much clearer. On the Conference site, Bao Haiyong, Director of Smart Tourism Research Center, Zhejiang University shared the new intelligence of AR+ tourism industry to the guests and based on the display of a series of tourism products integrating the virtual augmented reality technology, Mr. Bao believed that, as the representative industry of the experience economy, the combination of tourism and AR should undoubted to be the most closely connected, and the AR technology would further enhance the visual experience of the smart tourism service, bring the great market value of one-stop immersive interactive experience and thus truly put the closed loop of tourism experience into effect. Internet plus, smart tourism, region-based tourism, tourism big data, augmented virtual reality technique, sharing economy, integration of industry chain..., the sparks of thought ignited by the viewpoint confluence light up the future of the industry and the new pattern for world tourism has arrived with new Internet, new supply and new experience. 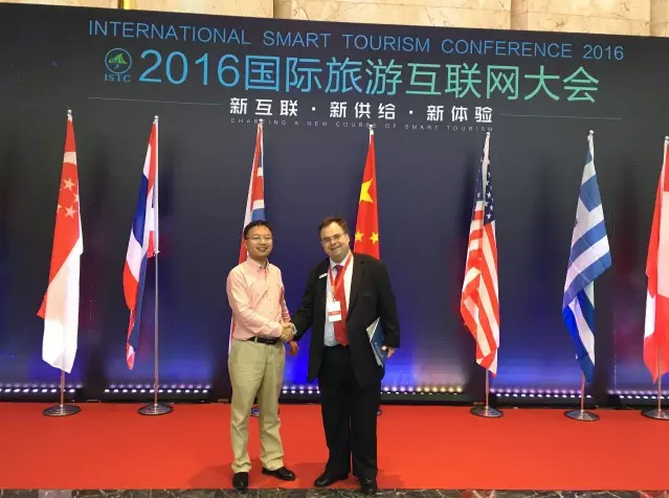 During the International Smart Tourism Conference, serving as the exclusive partner for international smart tourism solution for this Conference, EDC participated entirely to provide service and presented new experience brought by the international smart tourism to Chinese and foreign guests! Simultaneous interpretation for Shan Qixiang, Director of the Palace Museum, on his narration of Palace Museum’s history to the world. John Koldowski, Vice-chairman of PATA, speaks highly of the simultaneous interpretation. Receive great recognition upon EDC’s simultaneous interpretation performance from Professor Buhalis of Bournemouth University.